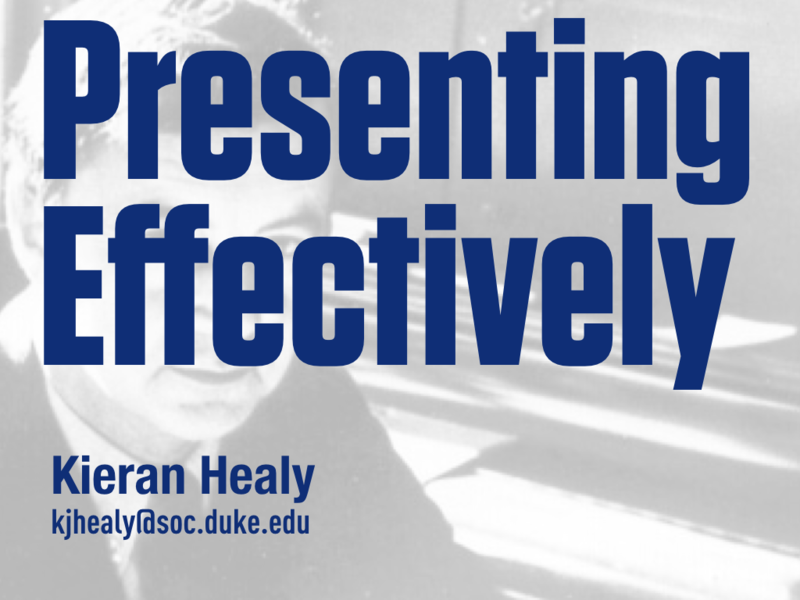 I was asked to give a short talk in my Departmental Proseminar yesterday on the topic of giving presentations, and specifically about making slides effective. 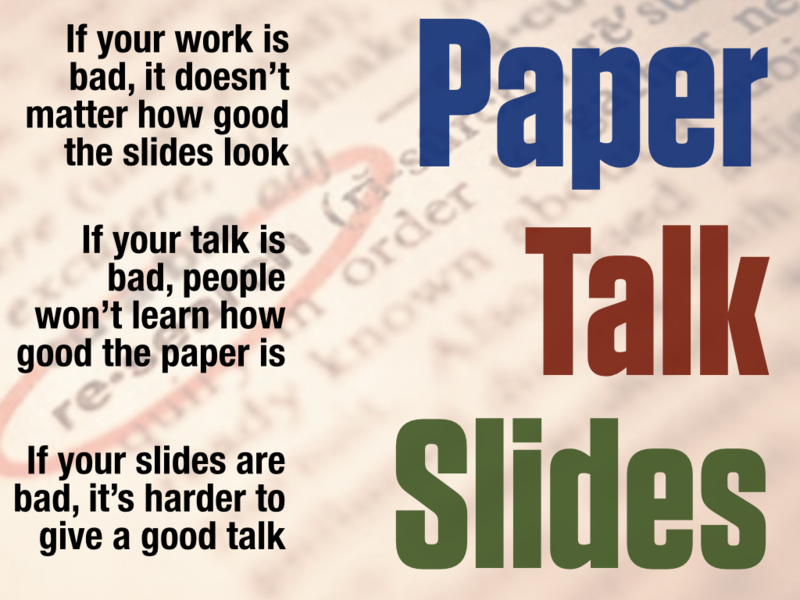 There is more than one way to give a good talk, and there is more than one way to make “good slides” or—better—make good use of slides and other material you might want to show people. So the things I’ll talk about and especially the specific techniques I’ll discuss are selected from many good ways to present yourself and your work. 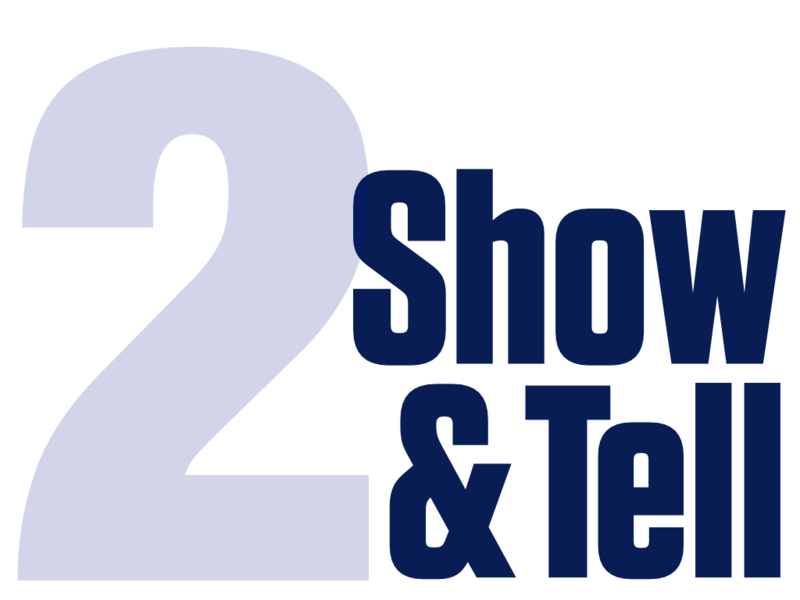 Presenting is a two-sided process, where you should be comfortable with what you are saying (and how you’re saying it), on one side, and where your audience should be able to follow along and understand your message, on the other. Presenting is a kind of performance. It is one of several ways we communicate the content of our ideas or research. The impression-management involved in any talk is often annoying. At times it can even be inimical to the intellectual activity you’re trying to get across. But it’s also unavoidable, and it is not entirely bad. Try to see it as continuous with all of the other forms of communication you engage in all the time—from informal conversation and written messages to formal papers and books. They all have their distinctive rituals and conventions, too. You need to know who your audience is. My audience is a group of graduate students in the social sciences. These are people just starting out, usually speaking in front of people who will have few if any strong preconceptions about them or their work. At times, such as a job talk, a lot might be at stake. 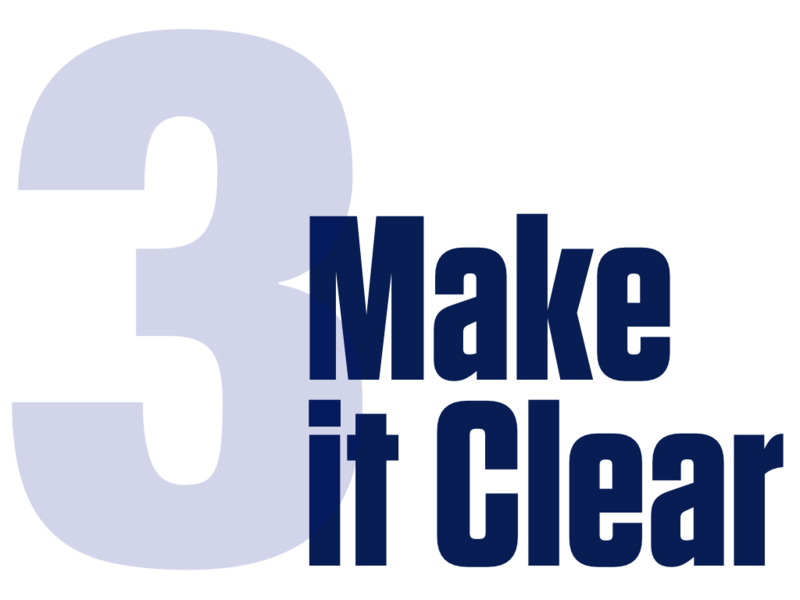 I’ll say three things. 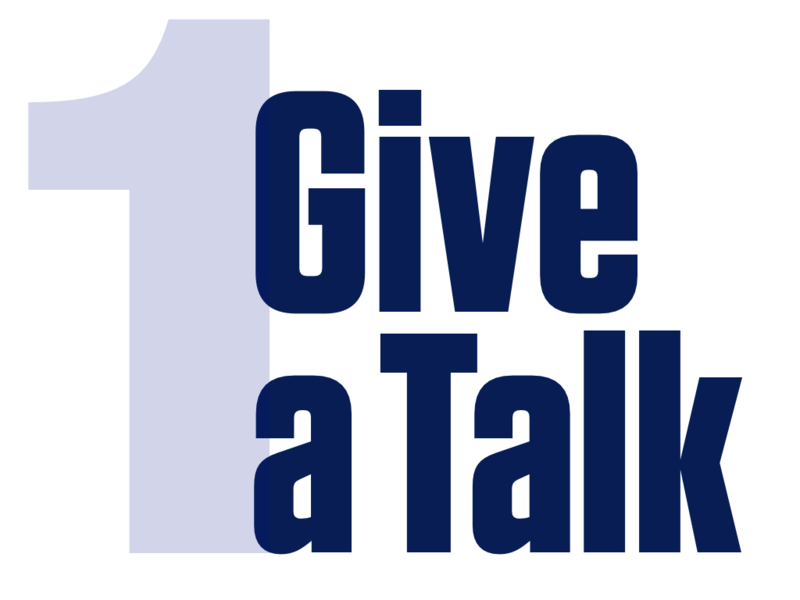 First, I want you to think about what a talk is, as opposed to (for example) a paper, or a set of slides. 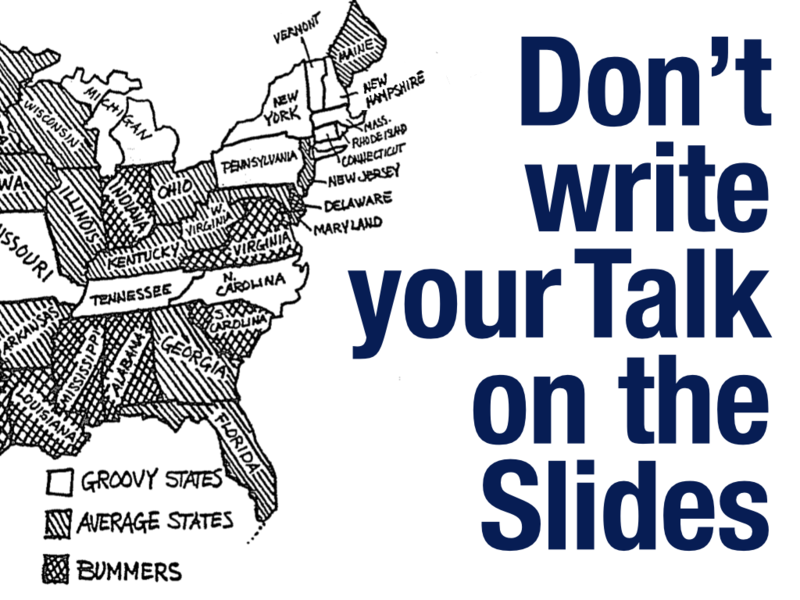 Second, how can you use slides to show and tell your audience what you have to say? I’ll talk about how I find it useful to layer, highlight, and repeat design elements in a way that helps the audience follow along. 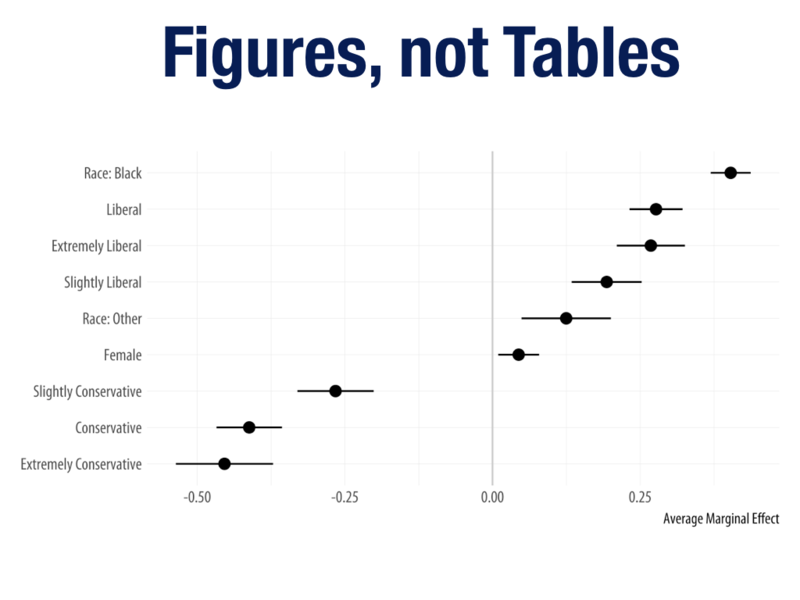 And third, a little more specifically, I’ll talk about how to make things clear on your slides when it comes to presenting results or details. First, what do I mean, “give a talk”? There are many ways to effectively run an argument or convey research results or bring your audience into the topic you want to develop. I’m not going to try to survey them. Instead, I just want to emphasize two things. First, and to repeat, a talk is a performance and inevitably involves a lot of impression-management, especially when something important is at stake. In a context like a job talk, what people generally want to come away with is the feeling that the presenter is in control of their material, that they know what they are doing, and that what they are doing is, ideally, interesting and important. What that means concretely will vary depending on who you are, what your research looks like, and who your audience is. 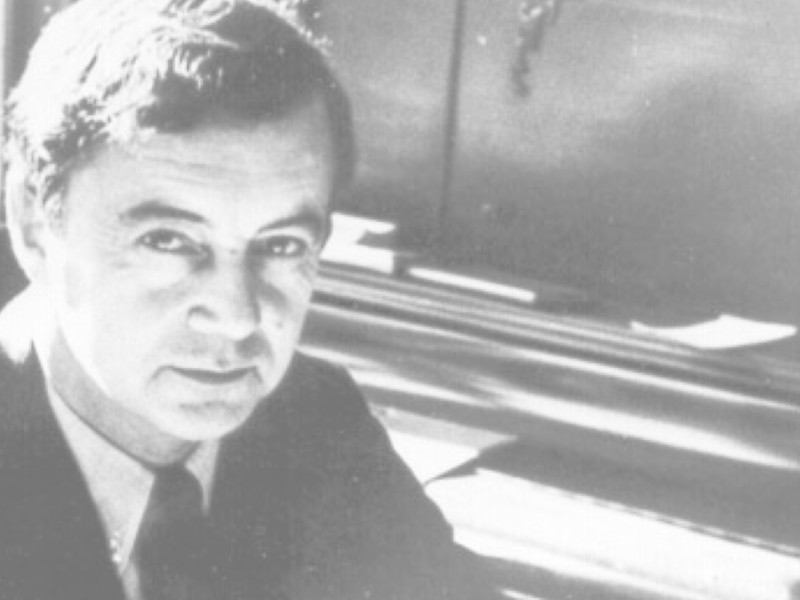 People are often not assessed fairly, or according to a single standard. But it’s also true that, whether as a matter of the investment that people have made in making the talk happen, or just in the pure desire to have a successful interaction, audiences really want talks to go well. Outside of adversarial settings, no one wants to watch someone bomb. This means that presenters start out with the audience on their side to a much greater degree than people often realize. Second, there’s the content of the talk. Behind every good talk is the actual content of what you have to say. This is always far more detailed than can be conveyed in the time you have. That content is a paper, or a chapter of your dissertation, or at least a specific finding or argument that you have spent a lot of time working out. For convenience, let’s just call it “the paper”. 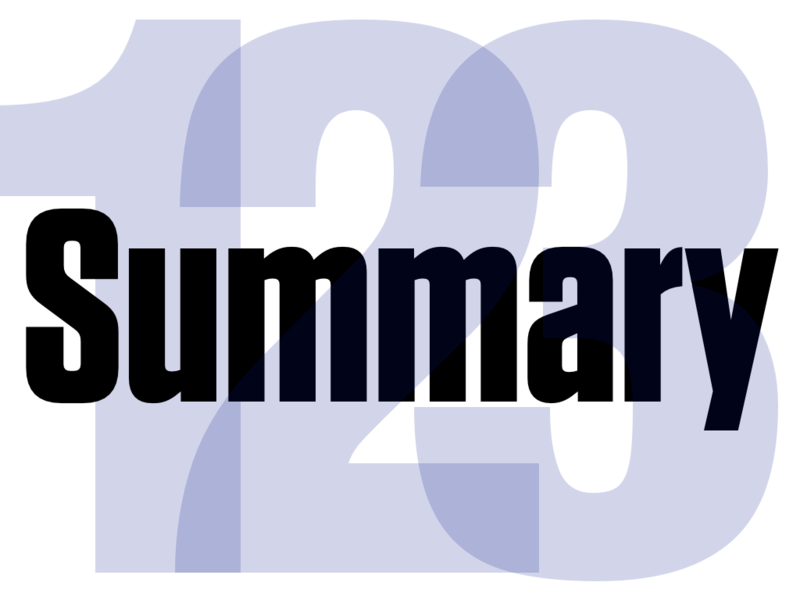 To put it bluntly, if the paper is bad, then it doesn’t really matter how polished the talk is, or how good the slides look. By the same token, if the talk is bad, then people won’t learn how good the paper is. And if your slides are bad, it’s going to be harder to give a good talk. What are slides good for? I think they are best thought of as signposts or billboards or advertisements for the talk you are giving. They’re meant to help the audience follow along and occasionally to show them important things. They support the content of the talk and keep people on the road you want them to be on. Now, think about what good road signs or effective billboards look like. They have strong imagery, they are clearly interpretable, and they contain few if any words. A corollary of this way of thinking about your visual material is this: don’t write your talk on the slides. 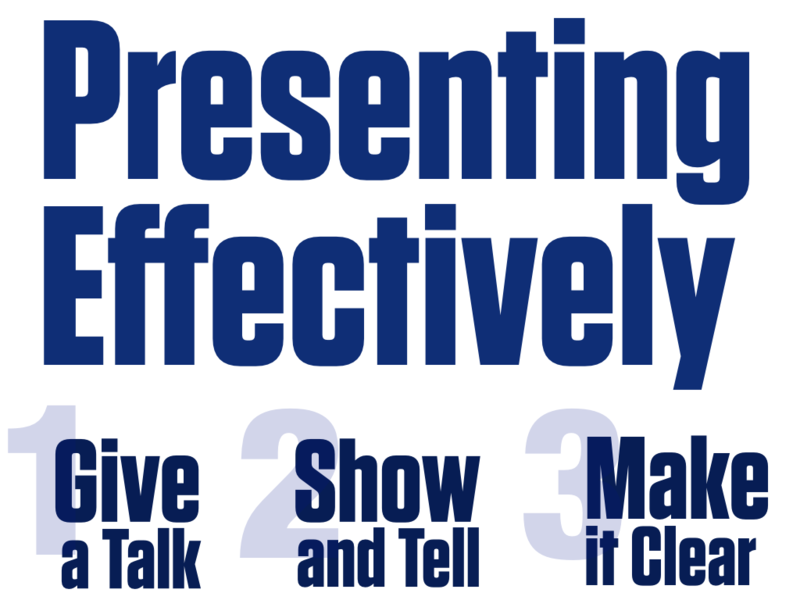 The most common way a talk fails is that the presenter uses their Keynote or PowerPoint slide deck as an outliner for themselves. They use it as something to help themselves, rather as something to help the audience. They start making notes for what they want to say and put those notes on the slides. All of that text (bullet-point after bullet-point) ends up on the screen, where they then read it to the audience. Don’t do this. This kind of bad talk is why many people profess to hate slides as such. Occasionally they are annoyed enough to generalize expansively about how PowerPoint-itis is a feature of the End of Thinking or the Decline of the West. Personally, I think those people have not been unlucky enough to sit through talks where the presenter has not even bothered to prepare slides. A related point is that using the slides as an outliner tends to make talks too long. In talks, as in life, you have less time than you think. 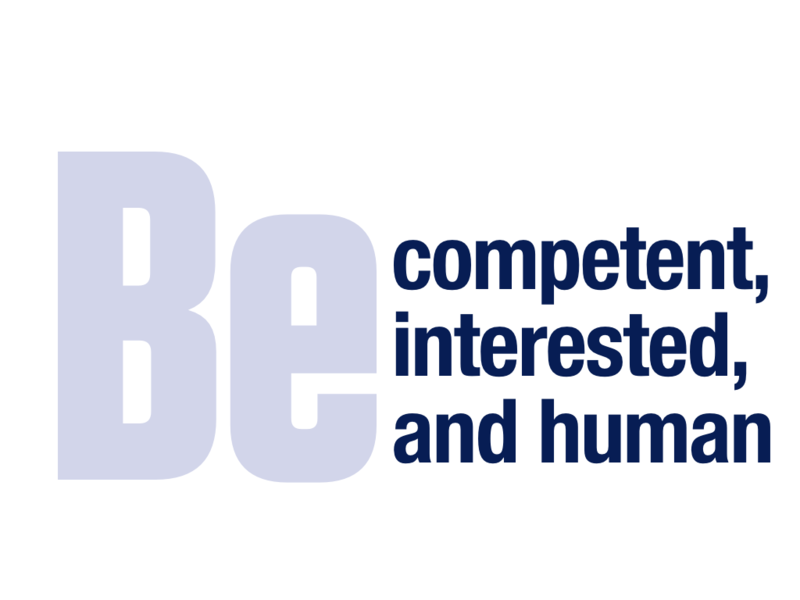 Half the battle of conveying competence and presenting effectively is being aware of what you can say in the time you have available. It is far less than you think, even after trying to take that fact into account. Even worse, the phenomenology of giving a talk is very different from that of listening to one. When you give a talk, time will seem to pass much faster for you than it will for your audience. If you run out of time and you have a very large number of slides with a lot of text on them, you will risk developing a kind of tunnel vision. The goal of “getting through your slides” will become a kind of death wish, a goal to be accomplished at the cost of your audience’s time and patience. What should your slides do instead? And how should you do it? The slides can help the audience follow along as you tell them what you are going to do, and then as you do it. 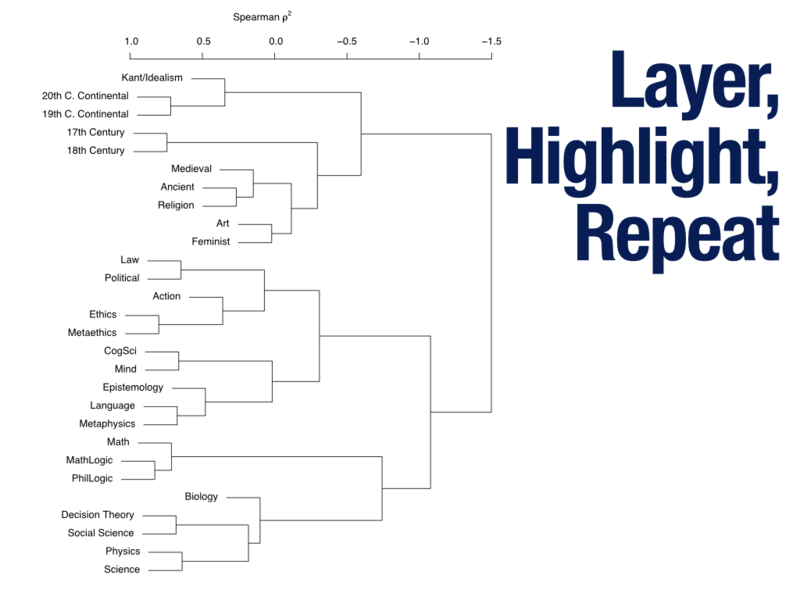 One straightforward but effective technique is to build up your argument, your data, or your findings, by layering material, highlighting new elements, and repeating methods of presentation or design elements so that your audience can follow the logic of what you’re saying. 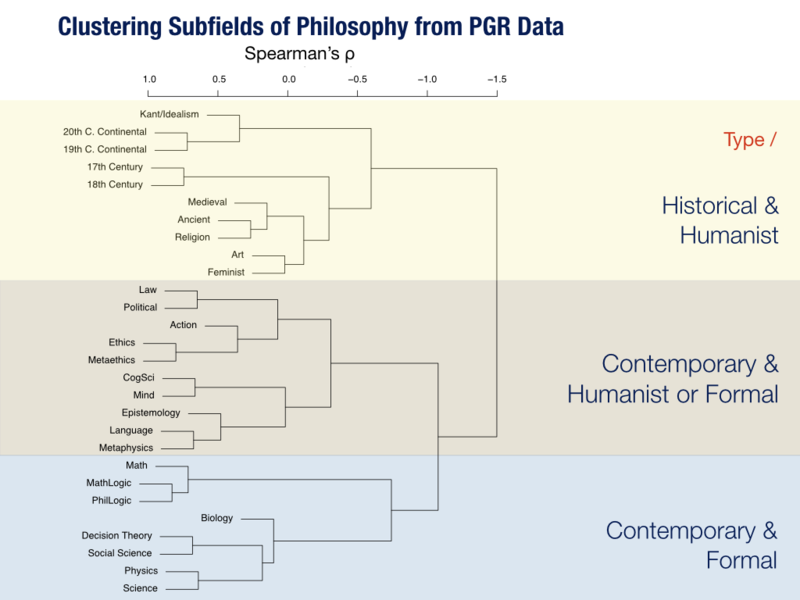 Here’s a slide from a talk where I’m trying to tell people about the corner of a specific field that I am going to be discussing. 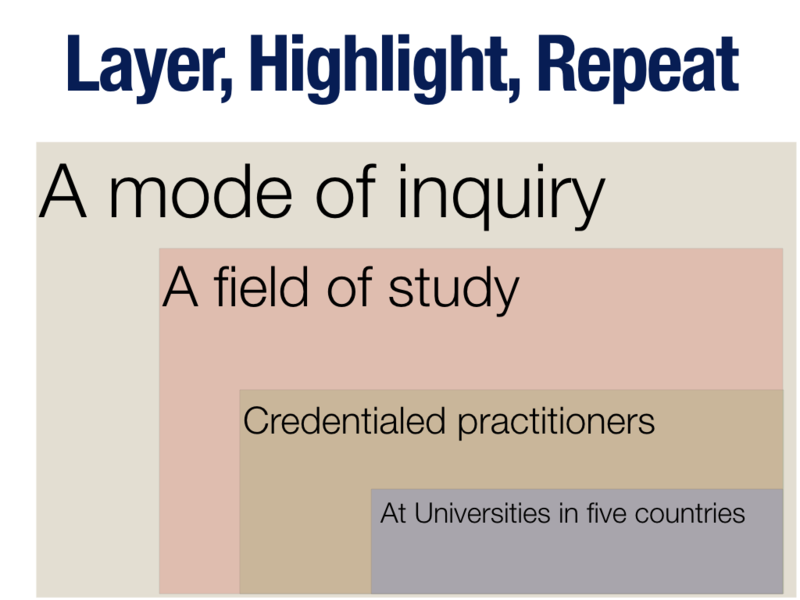 So beginning from the most expansive definition of the field (“A mode of inquiry”), we gradually narrow the focus to the actual content of the dataset by the time we get to “At Universities in Five Countries”. I repeatedly overlay the elements to narrow them down one piece at a time, talking about each step as I go. The repetition of design elements can also be used to connect your theory or ideas to the data you are presenting. 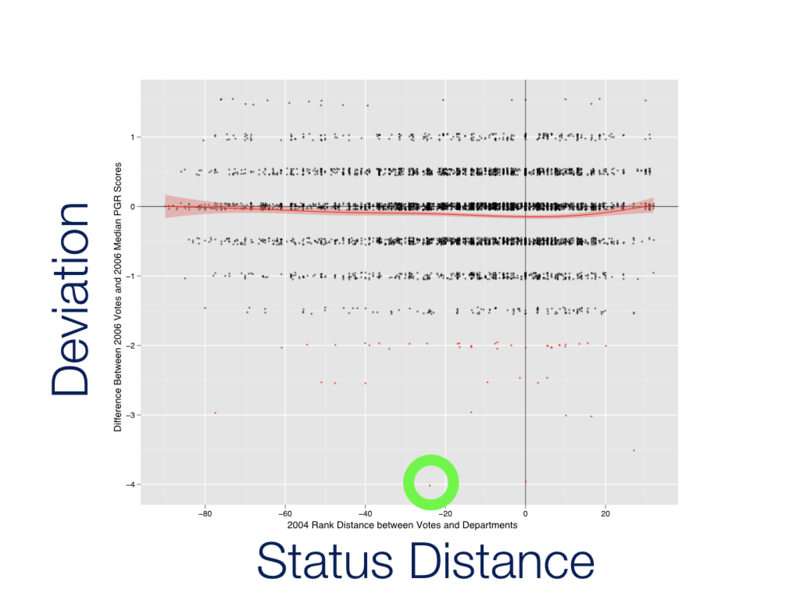 For example, here I know I am going to end up showing a scatterplot of the relationship between two variables, “Status Distance” and “Deviation from Consensus”. So I introduce the two ideas with that in mind. 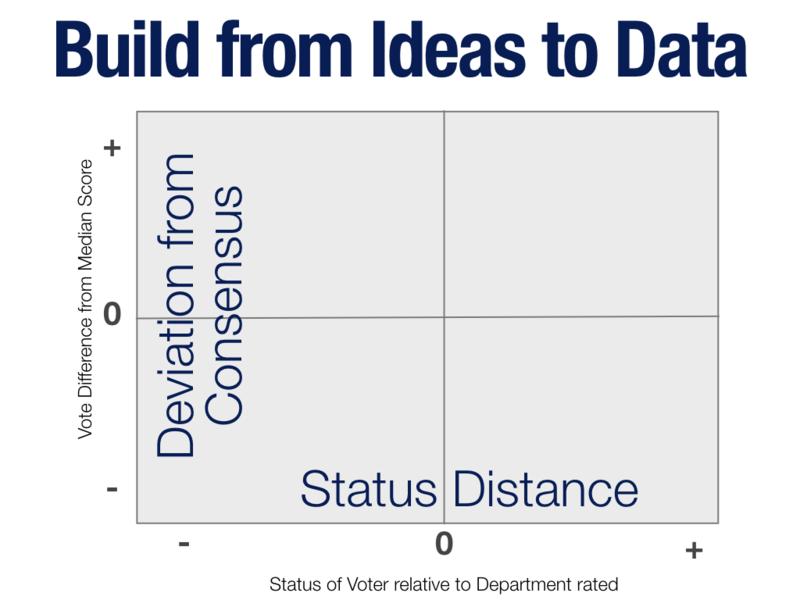 Then I talk about three possibly interesting ways that status distance and deviation from consensus might related, showing the audience what an idealized relationship might look like on the scatterplot in each case. By the time we get to the graph, the audience has the basic relationship in their minds, has a sense the shape of the association they might be looking for in the data, and can take the time to understand the details of the scatterplot without being overwhelmed by it, or by having to take in from scratch a whole lot of information about what’s on the graph. By anticipating the end point, we’ve (hopefully) brought them along with us as we’ve moved from the general ideas to our expectations for the data to the actual results. Again, your data will be different. Your goals will be different. 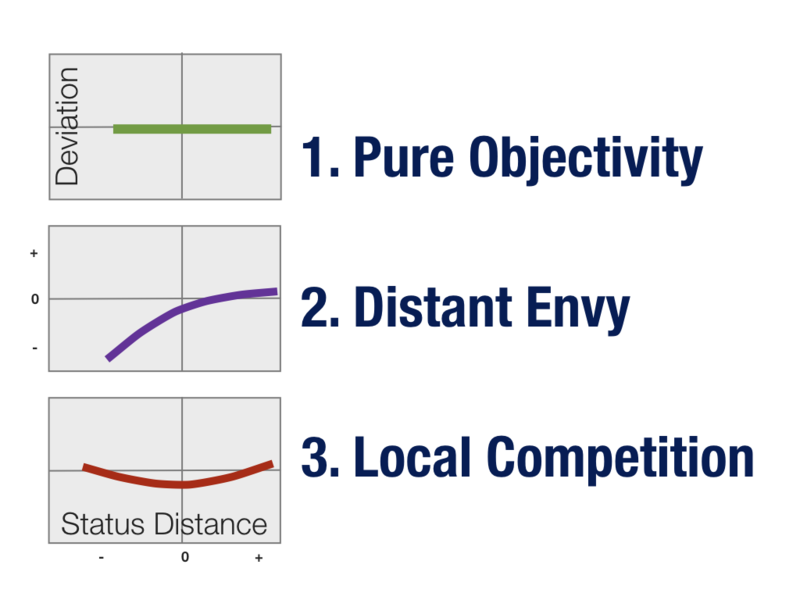 The general point is to think about how best to convey that data and those goals using the design elements in your slides. What else can we say about using design elements to make the details of your talk clearer and easier to follow? Learn how to make figures and graphs properly. That’s a skill that goes far beyond giving talks. I have written a book on data visualization that teaches you how to do it. Just notice here, though, that the figure here has many deliberate design elements meant to help the audience. The estimates are ordered by magnitude. The gridlines are visible but subtle. The zero line is slightly emphasized, and so on. 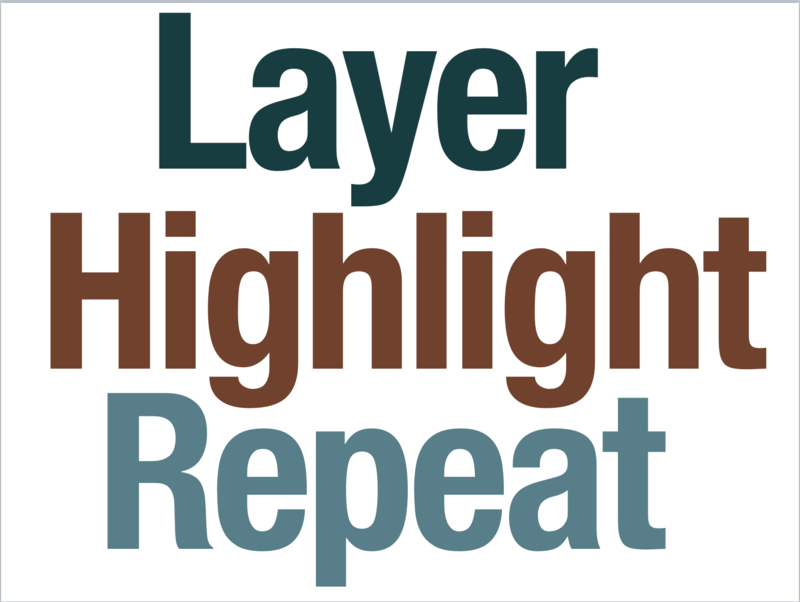 Layering, highlighting, and repeating elements can also be used with graphics and figures. 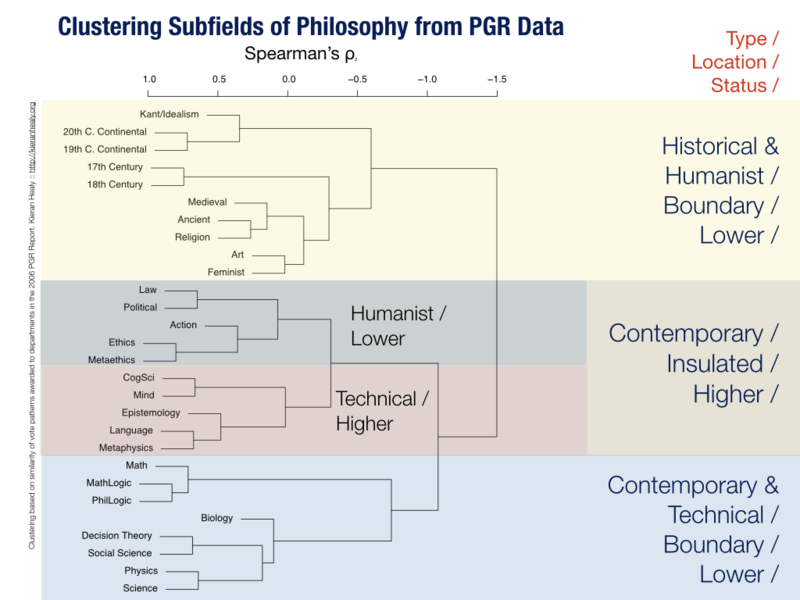 Here we start with a dendrogram of subject areas. It has quite a lot of small text. As I talk around the figure, giving an interpretation of it, I use some semi-transparent overlays to pick out some of the structure in the figure and make an argument about it. This can be done over several steps, focusing further on some particular areas of interest and building up the details of the interpretation. We can repeat these techniques both within and across slides, too. 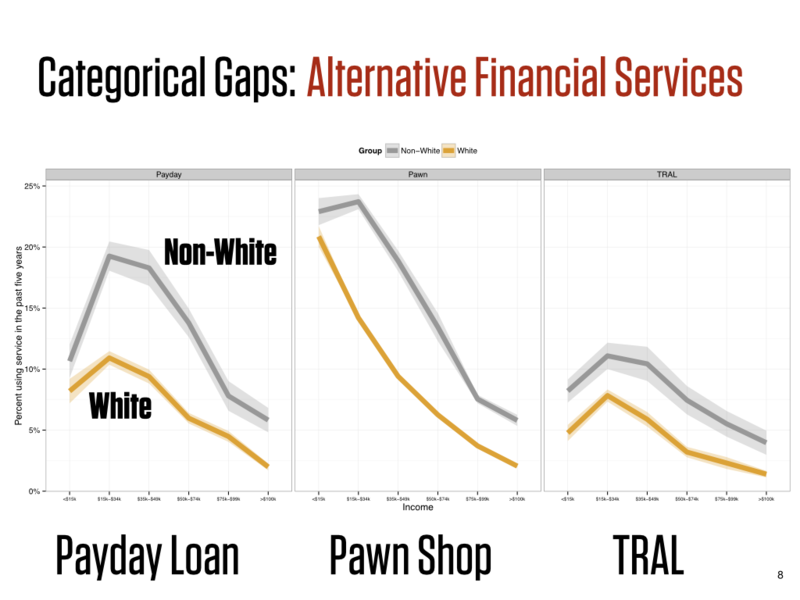 For example, here I have three figures with the same basic structure on the slide, showing gaps in the use of three kinds of alternative financial services. We pick out the labels as we go, and the audience can see how the gaps are consistent across the different items. 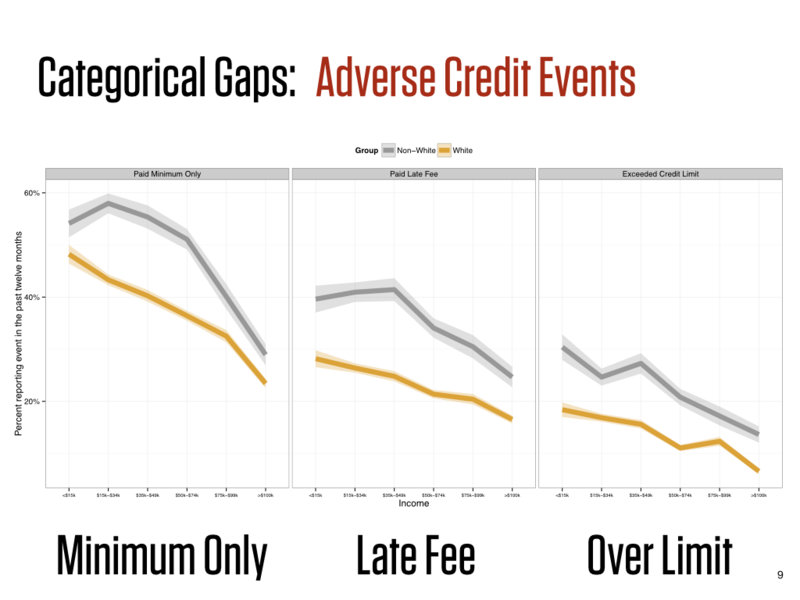 This gets continued on the next slide, talking about a different but related category, so-called “Adverse Credit Events”. The visual language, structure, and design elements are carried over in a way that lets the audience more easily understand what they are looking at, and lets the presenter continue to build their argument. In this slide the graph panels are also laid out in an ordered way, left to right from highest to lowest average incidence. Small details like this will make it easier for the audience to follow along. Sometimes tables are necessary. If you do use them, do it properly. Good tables are carefully laid out. 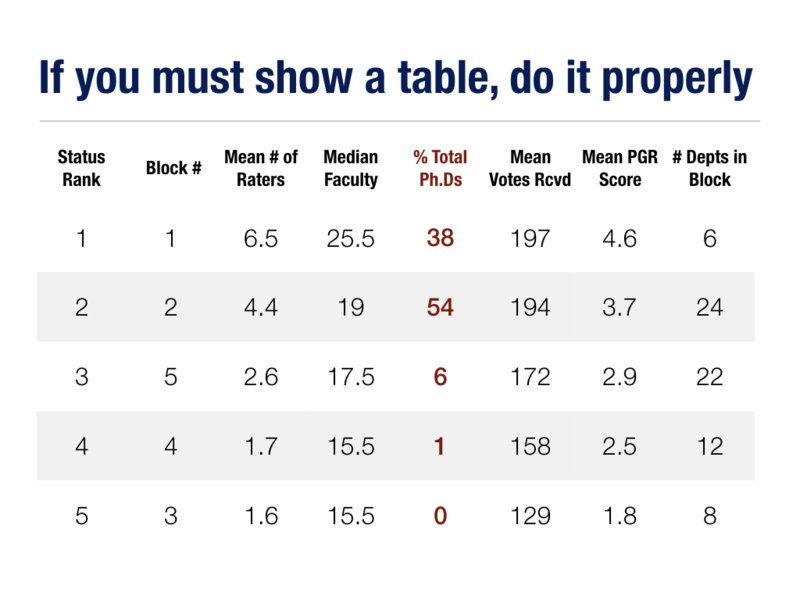 Look at the tables of results or summary data in journals like the AJS. They very rarely use vertical lines to separate columns. The white space in the columnar layout does that job instead. They minimize the use of horizontal lines, too, instead using spacing to separate parts of the table. When showing tables on a large screen, it can be useful to subtly differentiate the rows with an alternating background shade, as here, but it’s not always necessary. Judicious use of color can highlight elements of interest when needed. The paper is the most important thing. The paper is not the talk. The talk is about the paper. The slides help you give the talk. A few small techniques can go a long way to helping your audience out. Talks are a performance. That makes them annoying, but it also means that like most interactions, both sides want it to go well. Try to use that Goffmanian fact to your advantage when you can. That last point extends to the Q&A part of the talk. Do not try to stuff everything you have into your main presentation. (As I’ve said, this is an impossible task if you have actually done any work.) Instead, keep all that additional stuff in reserve. Anticipate where you will get questions. 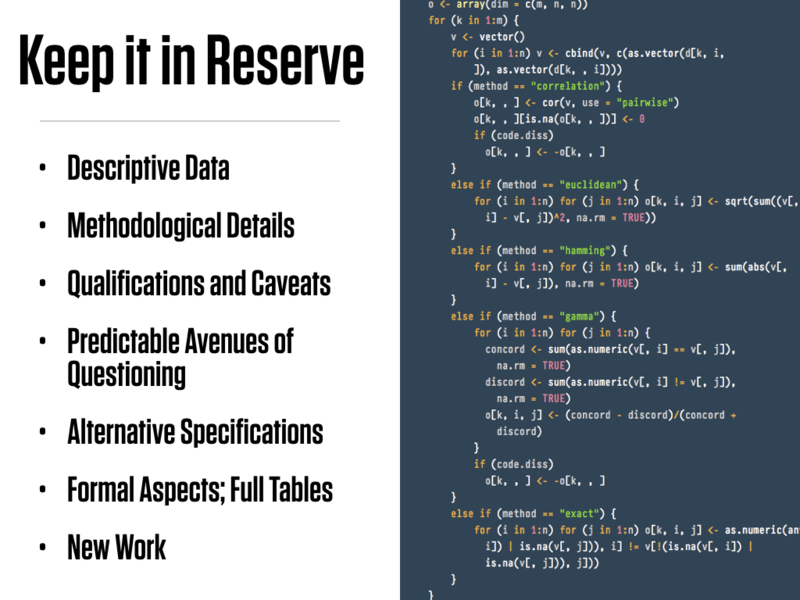 Leave openings for those questions and be ready with a response, including a slide if necessary. That way, you are more likely to have the ideal sort of performance, where the speaker and the audience can both come away feeling good about themselves: the audience because they asked smart questions, and the speaker because they were ready with an answer. This extends to the meta-level of feeling good, where the audience can feel good about the speaker’s competence, and thus feel good about their own good taste for choosing to invite the speaker out, or attend the conference session. Everyone ends up happy. This is far more preferable than the second-best outcome, where the audience (still determined to make themselves feel good) will fall back on wanting to feel more clever than the speaker, and pat themselves on the back for asking questions the speaker could not answer. All of this is a little absurd, I agree. But that’s just how it goes. You are sociologists. 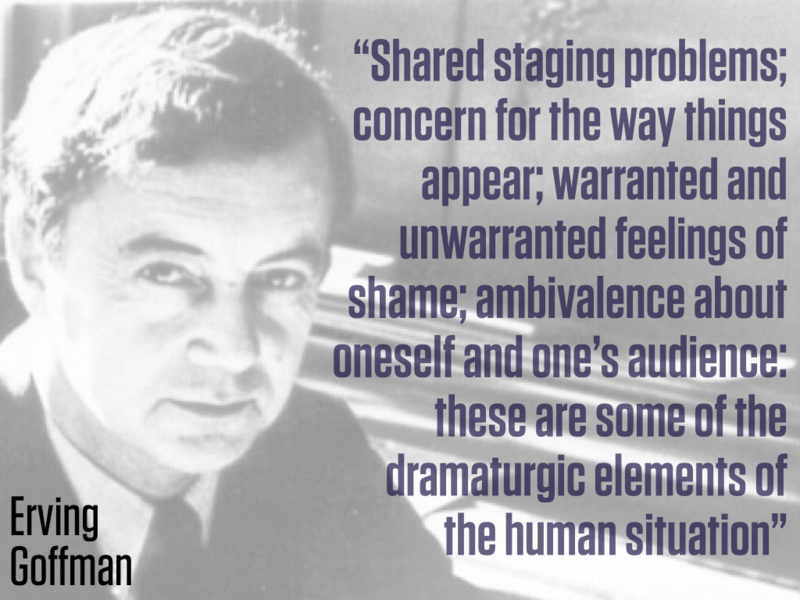 Remember your Goffman and do what you can to manage the interaction to get the outcome everyone wants.